This seemed too tight out of the box, making it difficult to move smoothly. The corners of some of the edges seemed to catch each other easily; I think a little roundness there would help. Lubrication, loosening the screws and scraping a few edge corners helped, and it's now pretty smooth and quiet . I have the stickerless red version and the contrast between the orange and red is strong and helpful. My son loves this 7x7 ... very smooth, not too loose or tight, and well-constructed. Out of the box it is smooth and fast, but definitely too loose. After lubing the core with traxxas 50k and the rest with DNM-37, and tightening the cube, it performs vastly better than the cubic aofu GT. It is one of the best feeling cubes I have tried, being extremely quiet for a 7x7. It has a similar feel to the yuxin red but it is definitely faster. The color shades are excellent, and it corner cuts very well. My only complaint is that the center piece caps do randomly fall off, while the edge and corner caps are glued on. If it were possible to magnetize this cube, it would probably be the best on the market, but as it is impossible to add magnets to this cube, I will give the slight edge to the qiyi wuji. There is just an incredible difference in performance of big cubes with and without magnets, as layers often misalign, which is unfortunate for this cube. Other than that, the cube performs well and is a joy to solve. I've had a V-cube 7x7 since a couple weeks after they came out. I figured it was a out time to upgrade, so I bought this little gem. Boy what an upgrade it was! This puzzle is far and away better than my old 7x7 ever was, and this was right out of the box. It's almost too quick, as I am still learning how to control it. I'm pretty sure I will be breaking old personal records very soon with this thing. Highly recommend. Out of the box this is a very smooth but dry turning puzzle. With some breaking in and lubricating, the smooth feeling stays but it is also attains stable and controllable turning on all the layers. Lockups are not very common; the cube maintains very stable even with fast turning. This cube has colored plastic caps on primary colored plastic. The only downside is that sometimes these caps do come off, although YuXin includes spare caps in the box, if you do happen to lose a few. Great puzzle. Turns very well, smoothly, and with good corner cutting. Much better than all other 7x7s (except for Wuji). I would definitely recommend it or the Wuji. It is very smooth and pretty good out of the box. Unfortunately, I had a corner piece cap break. Craig D. said: As good as the Moyu 7x7 and maybe better. I have a Moyu Aofu cubic 7x7 and a center piece does pop occasionally when I'm going too fast. I've done several solves with this Yuxin 7x7 and I haven't experienced a pop yet. It turns about as smooth as my Moyu. It's very light weight and the colors are bright and have good contrast. It's shipped with a few extra caps, but I'm not sure that I will need them as one has never popped off. Great quality and great price. corner cuts great for a 7x7 and is very smooth. 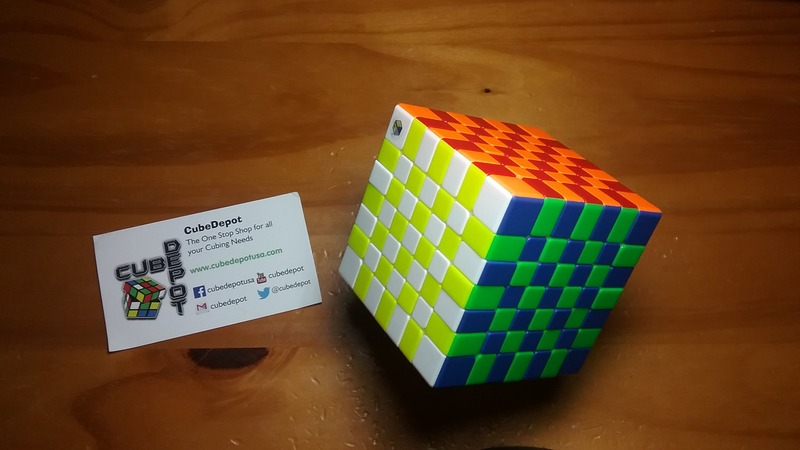 One of the smoothest cubes in my collection! !